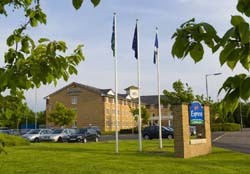 Holiday Inn Express Stirling boasts contemporary design and air conditioning throughout, plus revamped bedrooms. The hotel is designed to offer comfort and convenience with great hotel accommodation facilities and the perfect location for exploring Central Scotland, Edinburgh and Glasgow. The Trossachs National Park and Loch Lomond are nearby and Stirling itself boasts fascinating sights such as the William Wallace Monument, Stirling Castle and Blair Drummond Safari Park. Whether you’re on business or pleasure, of all the hotels in Stirling, a stay at Express by Holiday Inn Stirling is a great option. there 80 air conditioned guestrooms, meeting facilities, a licensed bar, coffee lounge and free parking. They have everything you need and will even throw in complimentary continental breakfast with every room rate. Each guest room has air conditioning so you're more likely than ever to have a great night's sleep at Holiday Inn Express Stirling. And don’t forget, every room price includes continental breakfast. With hotel accommodation to suit everyone, the hotel has 80 guestrooms located across 3 floors, with elevator access. The double / family rooms include a double bed and a sofa bed. They accommodate up to two adults and two children. 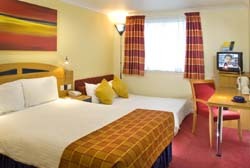 Our twin rooms have two single beds for a maximum of two adults The accessible rooms have specially adapted hotel accommodation facilities Every room has air conditioning, WiFi (charges apply), satellite TV with pay-movies, en suite with power shower, hairdryer, tea/ coffee making facilities and a work desk with a lamp. Prices are based on two adults per room.